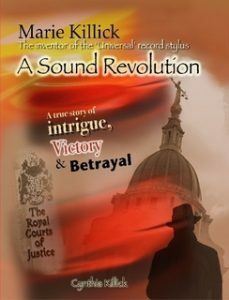 This chapter deals with Marie’s fight to prevent her creditors from having her declared bankrupt and the Official Reciever’s hostility to her in regard to her damage claim against Pye Radio. In the early part of September 1959, Marie had flown to Paris to negotiate a deal with the Banque de Paris for a loan of £25,000, using a share in her British Patent as security. This would enable her to pay her debts in full and regain control of her damage claim against Pye. However, while she was in Paris the Official Receiver had written to her informing her of a Creditors Meeting that she was to attend on 9th September. A colleague in England informed her of the meeting, stating that if she did not attend, then there was a possibility that on her return to Britain she could be arrested. If view of this Marie was forced to cut short her negotiations with the Paris bank and fly home to attend the meeting. She went armed with a draft agreement of her negotiations in Paris but the Official Receiver did not inform the committee of creditors at the meeting and Marie was forced to jump up waving the draft agreement in front of her and inform the creditors committee, that if she was given a little more time to conclude the deal, her creditors would be paid in full. She was told by the Official Receiver to shut up and sit down. The Official Reciever advised the creditors committee to have her adjudicated bankrupt. Unbeknown to her at the time Pye had bought one of her debts. The creditors voted to have her declared a bankrupt. When Mother read the letter from the Official Receiver she realised Mr Penny had put his own interpretation on the passage, ‘You are required to be present at this office in time for this Meeting and you should not fail to attend.’ Where had he got the idea that she could be arrested and imprisoned if she did not attend? She quizzed him on the matter and he told her he knew the Official Receiver had far reaching powers. Well it was too late to argue the point; she was back in England and ready to keep her rendezvous with the Official Receiver and her creditors. The day after Mother’s return from Paris, we piled into the back of Mr Penny’s car. We were off to Brighton and the creditors’ meeting. Mother sat beside him, their relationship somewhat strained; they talked about the possible outcome of the meeting as they drove through the Surrey countryside. It was not long before the wooded landscape gave way to the soft, rounded outlines of the Sussex Downs folding their way to the sea. Mother, despite her annoyance at having to leave her negotiations in Paris, felt quite confident about the outcome of the meeting. Her creditors would surely agree to her request for more time to finalise the loan. After all, all they were really interested in was getting their money, or so she believed. The children and I were dropped off at Dawn’s house. Glad to see my sister I chatted about Mother’s trip to Paris. “If things go well at the Creditors’ Meeting, we could soon be living in Monte Carlo. No more cold damp winters for Mummy. She really enjoyed her visit to France and rode down the Champs Elys.e in a horse and carriage and dined out at smart restaurants”, I reported gaily. “She said it was like a visit to heaven – as intoxicating as champagne,” I continued happily. “Now that mummy has a draft agreement to show her creditors, she will soon be returning to France to conclude the bank loan.” Dawn, who had been listening intently to every word, hoped it would not turn out to be another false hope, but not wanting to dampen my happiness, she kept her thoughts to herself. When Mother entered Dawn’s house later that day, it was obvious that things had not turned out as she had expected. Over a much-needed cup of coffee, she told us that before going into the meeting, she had seen the Official Receiver and his Assistant Mr Yelland in his office. “It should have been clear to them both from the draft agreement that, if allowed the time to conclude the deal with the Bank, I would have the money to pay all my debts.” As she spoke she lit a cigarette and drew thoughtfully on it. We were all ears. “What happened?” I asked. Throwing her hands up in disgust she told us indignantly, “Not one of the creditors stood up for me and I had no alternative but to sit down.” She nearly exploded in rage as she remembered the humiliation she had felt. For those not familiar with bankruptcy proceedings, a number of creditors are elected to serve on a ‘Committee of Creditors’. It is their task to act on the behalf of all the creditors. Mr Wilner, the solicitor acting for Mrs Thomas, had been elected to the Committee. He was, it turned out, also acting for the Official Receiver. Since Mother was still involved in litigation with Mrs Thomas, was it strictly ethical for Mr Wilner to be acting for one of the creditors and for the Official Receiver, who acts in place of the bankrupt? Mother’s anger as she spat out the word bankruptcy was barely contained. Too furious at the moment to feel despair, she stubbed out her cigarette, wishing it was the Official Receiver’s head as she ground it to pulp in the ashtray. Pausing only to light another cigarette before resuming her tirade, she continued, “Some pretty searching questions are going to have to be answered, and before the Judge too!” Angrily striking the questions off her fingers one by one, she continued, “Why had the Official Receiver been hostile to me from our first meeting? Why should he engage Mr Wilner, Mrs Thomas’s solicitor to represent him, since there was clearly a dispute going through the courts at the time between Thomas and myself? Why should he try to keep the loan of £25,000 from my creditors? Why did he not direct the creditors to allow time for the Banque de Paris to come forward with the money, which would more than clear the debts and leave a tidy sum over for me to pursue my damages? He has certainly got some explaining to do,” she concluded. The article went on to report that she objected to a receiving order being made against her and objected to some of her creditors by name. She was reported to have told those present at the meeting that she could settle her debts in a week as she was hoping to get a loan of £25,000. The Evening News went on to say that the ‘Official Receiver said he had received claims for £14,000 from banks, hotels and solicitors. There were other unspecified claims.’ The creditors resolved to seek a Receiving Order. The Daily Mail reported the Creditors’ Meeting on 9th September. “The meeting unanimously resolved to ask for a receiving order against her. In July last year after a ten-year legal battle. Pye Ltd, lost a High Court appeal against a ruling that the Patent was Mrs Killick’s. None of the newspaper reports had picked up accurately on the £25,000 loan, or that it had been left to Marie to inform the creditors of the draft agreement with the Banque de Paris. Mr Parker, the Official Receiver, had been in touch with Pye’s solicitors; surely that was the reason for his hostility towards Mother? The fact that he was determined to take Pye’s word for the amount of damages owed her is, I think, amazing – Pye after all had denied infringing her patent, which had been proved to be blatantly untrue. The man was obviously in Pye’s pocket. Now that the creditors had voted to have Mother adjudicated bankrupt, she had to move fast. She had to press on with the fight to gain control and she lost no time in going to London to see what could be done. In view of this statement, I find it hard to understand why the Official Receiver did not agree to allow Mother time to conclude the deal with the Banque de Paris!